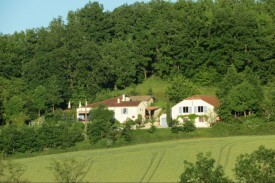 Bounetis Bas is situated on a mountain with beautiful views over the valley. The garden has several cosy corners and beautiful terraces. It's a place to relax. 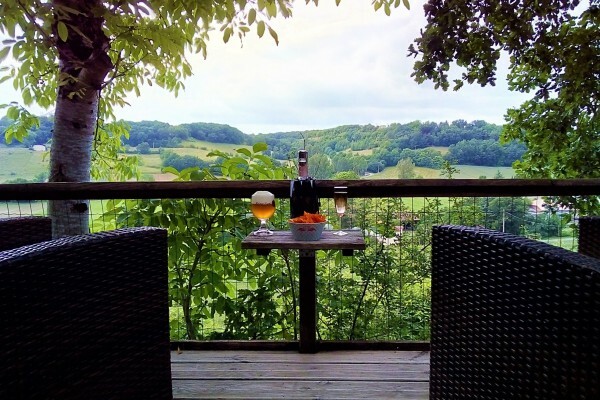 Let yourself be carried away by the beautiful views, sipping a delicious wine and eating a good meal while enjoying the sunset in the evening ... live like God in France! 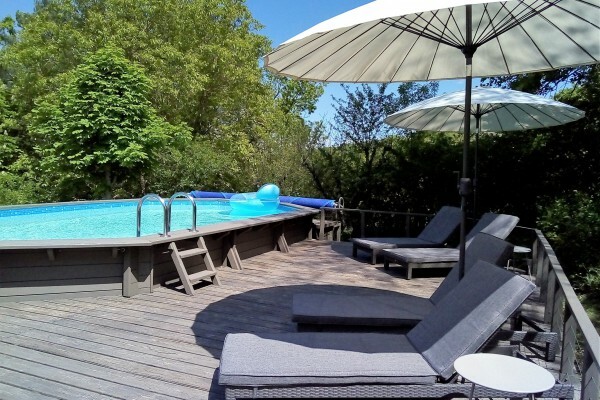 Of course you can also have fun in the heated swimming pool with sun terrace or play a game of pétanque. Hospitality, serenity and space are characteristic of the area. In addition to the beautiful nature, where you can go hiking and cycling, there are also many picturesque villages, often situated on the hillsides, which offer a nice view of the surrounding area. There are various recreational lakes, some of which include water sports and (sailing) boat rentals. Canoeing on the rivers, visiting caves, tree climbing parks, museums etc. The Tarn-et-Garonne is not a big tourist department, but there are plenty of things to see and do. The Canal du Midi flows through along a hiking and cycling path and also the pilgrimage route to Santiago de Compostella crosses the Tarn-et-Garonne. Also for those who like culture there is plenty to discover and visit. Due to its central location, it is also easy to take trips to e.g. Cahors, Agen, Pujols, Rocamadour and Toulouse, but also the Pyrenees mountains can be visited during a day trip. Let yourself be surprised by the beauty of this relatively unknown department. All rooms have a private entrance. An extra cot can be added to the rooms, availability of a baby cot is always on request and needs to be confirmed by the owners. The Doré room can also be rented as a family room for up to 4 people. Extra bed / breakfast: € 20, - per night. Room Doré: Double bed 180x200 + 2 single beds (surcharge 20 € pp / night breakfast incl.). Bathroom with shower and toilet. Tea and coffee making facilities. Rooms Menthe and Rosé: In the summer, we rent the rooms Menthe and Rosé on a weekly basis (for prices: see gîte 'La Maison'), but please feel free to ask about the possibilities, depending on the occupancy, these rooms can be rented as a guest room for a few nights. Room specifications: Double boxspring 180x200, possibility of 2 single beds. Bathroom with walk-in shower and toilet. Tea and coffee making facilities. Als je op zoek bent naar een oase van rust in een verzorgd, met oog voor detail, kader, dan is dit de plek voor jou. Ivo en Ineke zijn de perfecte gastheer en -vrouw die je een geweldige vakantie bezorgen. Wij logeerden in gîte "le chalet", die beschikt over een terras met adembenemend uitzicht. Voor de kleine gastjes is er een boomhut, aanpalend aan de gîte, en de gîte zelf is uitgerust met alles nodig om zelf een lekkere maaltijd met verse streekproducten te voorzien. Het ontbijt was meer dan prima, met iedere dag een afwisselende fruitsalade, vers fruitsap, een wisselende warme bereiding en de usuals zoals koffiekoeken, stokbrood, beleg,... Ook ' s avonds kan je van de kookkunsten van de gastvrouw genieten en aanschuiven voor een heerlijke driegangenmaaltijd. Wij hadden jammer genoeg geen goed weer voor de tijd van het jaar maar in de zomer moet het heerlijk vertoeven zijn aan het zwembad en de bar. Wij hebben alvast genoten van een spelletje petanque en onze zoon van het speelpleintje. Bounetis Bas leent zich ook prima als uitvalsbasis voor het maken van daguitstappen, zoals naar Cahors, Toulouse en Rocamadour en is gelegen vlakbij Lauzerte, één van de charmantste dorpen van Frankrijk. Wij komen zeker terug! Did you stay in Bounetis Bas? Let us know what you thought about it and help others to make the right choice! * I confirm having stayed in Bounetis Bas. 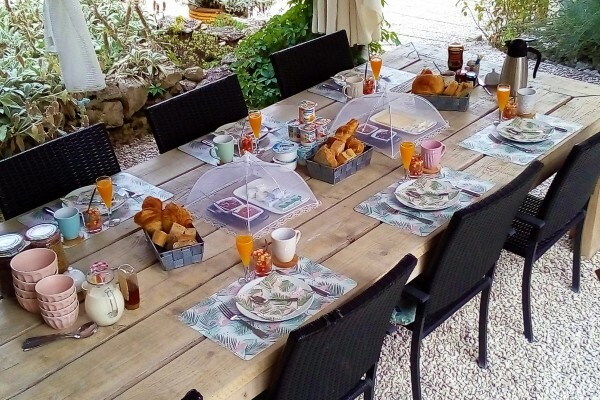 Find other bed & breakfasts in Lauzerte or all bed & breakfasts in Midi-Pyrenees.